The Link2 roller banner is the world’s first fully linkable banner stand, offering your brand flexibility at events and exhibitions. 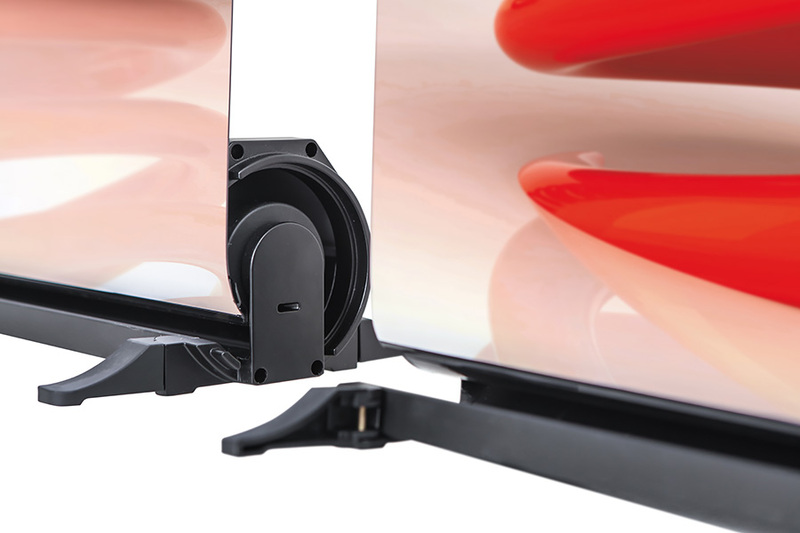 XL Displays is one of only a handful of Link2 distributors in the UK. Link2 pull up banners can be joined together to create an exhibition backdrop as large or as small as you need – providing a professional exhibition stand using simple roller banners. No matter how big your display, it will always be simple and easy to set up and use. The Link2 is ideal for businesses that attend exhibitions on a regular basis and often change their marketing materials because it also features interchangeable graphics. This means you can change the graphics yourself within seconds – no fuss and no need to return the hardware to the supplier or buy a new graphic cassette. Simply buy a replacement graphic panel and do the rest yourself – saving time and money. You can use the hardware indefinitely, maximising your return on investment. We offer Link2 as either a single roller banner, or in kits of up to three banners. If you already have a single banner and want to extend it, we offer the easi-link kit or the flexi-link kit. 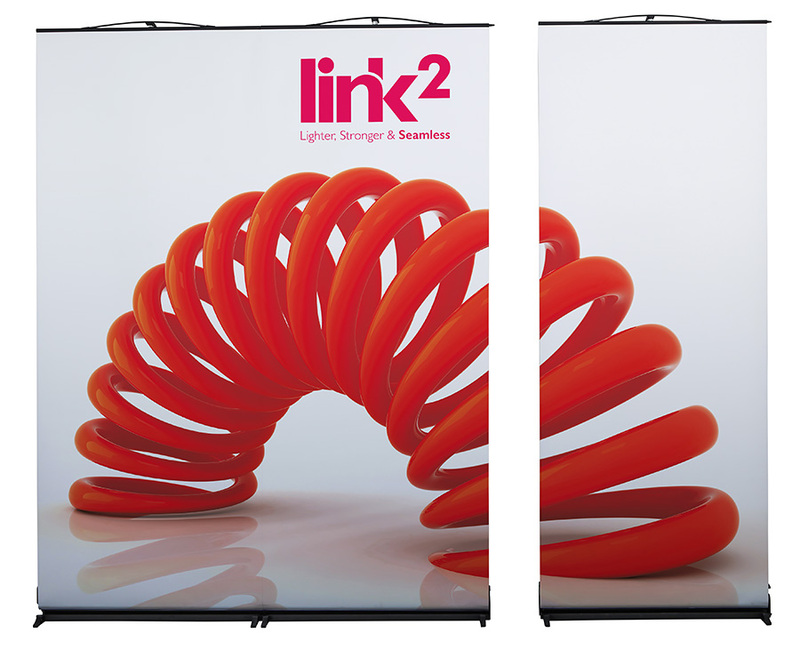 The easi-link kit, directly joins two Link2 banners together, whilst the flexi-link kit adds a thin graphic panel in the middle, allowing you bend the banner around corners. Multiple Link2 roller banners are linked together using an all new, patented system that ensures graphics are always seamless, even when exhibiting on uneven flooring. The bases of the Link2 slot together, forming a solid connection which provides maximum stability. The Link2 roller banner can be set up quickly and easily in just a few minutes. It can also be dismantled just as quickly. Included with the banner is a base with an integrated graphic panel and three upright sections that form the pole. No tools are required when setting up your Link2 roller banner. The first section of the pole should be placed into the top of the hardware horizontally and twisted 90° until secure, the other two sections of the pole simply fit into each other. The graphic can then be pulled out and hooked on to the top. To link two or more Link2 roller banners together, simply slot the bases into one and other to form a solid connection. The top of the banner features male and female connectors on the top, this slots into the other graphic, bringing the two together. This process can be continued indefinitely, creating a display as big as you’d like. Should your Link2 lose tensioning, unlike other banners which would be unusable, you can add tension back simply by twisting the tensioning system in a clockwise motion. The tensioning system is located on the left hand side of the Link2 hardware when looking at it from the front. Please see our Link2 video under the technical specification tab for more information on the set up, uses and dismantling of the Link2 roller banner. Quality Assurance - We print and manufacture the Link2 graphics in-house, allowing us to have full control over the quality. We will only send out products that have been test built and are quality assured. Price - We regularly review our pricing to ensure it is as competitive as possible, without compromising on the quality. Free Artwork Check - If you have your own artwork, one of our designers will check this to ensure it is in the correct format to produce the best quality print. We will only print a graphic when we are sure it will provide a high quality finish. No Artwork? Don’t Worry - We offer a graphic design service where one of our designers will work closely with you to create artwork that meets all of your requirements. Customer Service - As winners of the Peterborough Business Awards 2015 – Customer Service Award, we are proud of our high quality customer service. Be assured we will be there to assist you through every step of your order. The Link2 roller banner starts at just £225.00, we also offer Link2 kits with multiple banners and linking kits to create an exhibition display that works for you. At XL Displays we are experts in exhibition stand design and provide everything from custom exhibition stands to portable displays such as pop up stands, roller banners and promotional counters. For more information, please contact us or call us on 01733 511030.